It's a good job with no heavy lifting but it does require that I sit at a keyboard for long periods of my life clattering away (at about 70 words per minute - I've slowed down in my old age) producing written materials. Some of these words are news stories, some are blog posts, some are press releases, some are communication strategies, some are silly twiddlings for fun but all of them, every last one, have for the past 20 years put food on my table, shoes on my children and a roof over our heads. I love being able to think about something, write it down and have it magically become worth something to someone. I've written for an employer, written as a freelancer, written for fun and written for profit. I produce intellectual property and I get to charge people for it. Rarely does this put me in harm's way (legal threats notwithstanding) and I'm usually home in time for dinner. Copyright has been good to me and long may that continue. But copyright isn't what it used to be and these days it's the bone of contention in a fight between copyright owners and consumers. Copyright isn't broken but by golly there are those that are trying to bend it to fit a new and bizarre shape. Copyright laws basically give the creator of content a monopoly over that content for as long as they see fit. Some can immediately change those rights (this is their right, after all) and give the stuff away for free. I do that regularly myself and I have no problem with Creative Commons or any of the other copyright alternatives out there. Or you can hang on to the copyright until the day you die… and possibly even longer depending on where you live. Die. Whatever. This then is the problem because copyright these days isn't about protecting the author, it's about protecting the content owner and the needs of an owner aren't always aligned with the wishes of or indeed the best interests of the author. Take Shakespeare. Would we be reading his works in school if they were still in copyright? We would not because the cost would be too high. And all those movies and TV shows based on his writings? Nope. But let's take it one step further - what about Will himself, a man who never saw a storyline he didn't want to "borrow". Julius Caesar, Romeo and Juliet, all of the Henrys and even the Richard, all based on someone else's writings and often on several other someone's. Today's world of copyright is one of insurmountable barriers to consumption. It's one where you can buy the content you want (sorry, the right to engage with the content you want) only on certain terms and woe betide you want to do it in another way because you'll be a THIEF and a SCOUNDREL and we must have MORE LAWS to protect us from your FOUL DEEDS. We need a way to protect copyright without criminalizing the customers. We need a way to ensure the customers aren't just taking the material without paying for it and we need a way to ensure the content producers are fairly recompensed for their intellectual efforts. Currently hardly any of that is working well. Corey Doctorow was in town this week for a talk about copyright at the NetHui Copyright session organised by InternetNZ and held in Wellington. Doctorow is almost as famous for his opposition to modern copyright regimes as he is for being an actual paid author so his writings on the subject are always of interest. His musings on digital rights management (DRM) are particularly entertaining, especially if you've ever encountered my favourite error message, YouTube's "The uploader has not made that content available in your country". I suspect it actually takes more effort to do that than to just publish the damned video in the first place. Ah, the internet. Borne of 1960s Woodstock, free love, flowing yet somehow greasy locks, of the yearning to be free and interconnected but also holding on to that dream of a military-grade information sharing platform that can't be knocked out by Soviet nukes. Today the idea that we have an internet at all is one that frankly boggles the mind, given the extremes of views around the world, often between people ostensibly on the same side (and occasionally, in the heads of the one person naming no names Donald). Some want nothing banned, a free-for-all where children can download bomb-making recipes and 3D print kidneys for their ageing parents (or some such). Others want hate speech banned, fake news to be thrown out and for us all to get along. Yet more want Our Glorious Leader to be enshrined in a Position of Power for All The Upper Capital Fellows to Know and Love. Some just want to be forgotten. Others want to be stars, even if only for a moment. It's all a bit of a muddle really and creating laws around this muddle has been something of a challenge for many jurisdictions. Laws, you see, tend to apply to a geography. In this [place] it is legal/illegal [pick one] to [do the thing] that would get you arrested/not raise an eyebrow [pick one] in [the other place]. That doesn't really work when you're not in a particular place but rather "on the internet". And so we have a looming schism unless we can all get along. Given the current state of world politics, this really could be the least of our problems. In Europe, for example, they take a dim view of certain behaviours that in the United States are veritably held up in high esteem. No, I'm not talking about gridiron, I'm talking about online privacy and the right to not have your personal data shared far and wide for advertising purposes unless you really want that to happen. So, the EU has introduced a new data retention law that affects all data stored in the EU but also, quite significantly, data stored about EU citizens anywhere in the world. I'm an EU citizen. Some of you have data stored about me. Have you considered your responsibilities under the new GDPR (General Data Protection Regulation) and how you'll go about discharging that with care and consideration? Probably not, I'm going to suggest. The EU proposed (and indeed introduced) the GDPR two years ago with a deadline of May 25 this year, yet tellingly a recent report suggests 22% of EU businesses don't know how they're going to implement GDPR regulations in their own business. Yes, the EU is indeed making rules that will apply in New Zealand. While this is in and of itself a very interesting set of issues for New Zealand and for data protection around the world, what is even more interesting in my mind is that even now, decades into this digital revolution, we still don't have a unified joined-up view of how to manage all of this. If the EU can enact laws that may or may not bind New Zealand companies, what's to stop Saudi Arabia doing the same? Or Russia? Or China? Or, gods forbid, Donald Trump? What becomes of sovereignty and independence in a world where our primary means of communication, of commerce, of education, of health care and of economic prosperity is a shared resource that we don't fully control or indeed (if we are elected officials) understand? For every story about a new app, a unicorn stock, a start-up that's changing the world, a technology that is truly revolutionizing a country and making people's lives better, there seems to be an equal and opposite story of greed, of lying to customers, of ripping off shareholders, of trying to profit from other people's misery. From the CEOs who sell stock before announcing a problem with their product to the Pharma Bro who saw an opportunity and is now serving time for his efforts (although of course he wasn't arrested and convicted for ripping off patients but for ripping off shareholders. Patients, it seems, are fair game), to the business managers who make up fake products to sell on to unsuspecting buyers, the tech sector is full of these cowboys and I'm sick of them. Every industry must be littered with this people but for some reason it irks me more in the tech sector. Is it because of the immense promise I see stretching out before us? Is it just that I used to get to write about spammers who were unrepentant and the snake oil salesmen with the obviously crooked money making schemes who threatened physical violence and legal action (neither materialized) and if they were very bold to "never advertise in that rag again". Yeah, whatever. I suspect that's it though. We see these products and services being touted as being better than what they're replacing and often times they are but usually there's a catch and sometimes it's just that the service is illegal or doesn't work or isn't what it says on the tin. I used to have an app that would let me photograph someone's business card and within 24 hours all those details would be added to my address book and to my LinkedIn page so I could connect with them. What optical character whizz this is, I thought, until I discovered that rooms full of Indian children were being paid a pittance to squint at my photos and type them up. Or take Uber - a product designed to free the driver from the tyranny of the taxi company through a shiny app that makes everyone's lives easier, but still requires a driver to be shackled to the yoke of corporate demands and which made a lot of money by destroying the market. The same could be said of Facebook which has decimated the print advertising market but shuns all responsibility for the future of publishing even as readers cry out for unbiased content. I have no idea how to fix this because the same drive that creates an innovator with a solution that will help the world also drives an innovator with a product that will help them get rich quick, even if it means someone else has to suffer along the way. 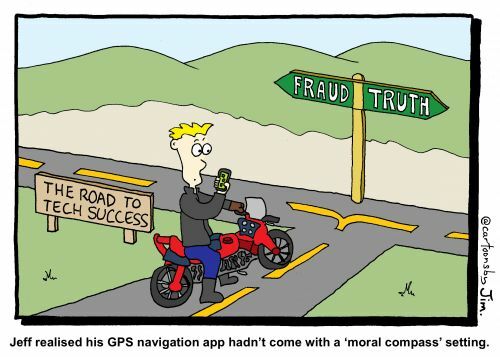 All I know is it comes down to ethics and having a moral compass to steer by. I'm not sure how we can retro fit those in to our entrepreneurs but given the state of the market I suspect we're going to have to. We really do need professional bodies like ITP, with a focus on ethics and good practice, now more than ever before.